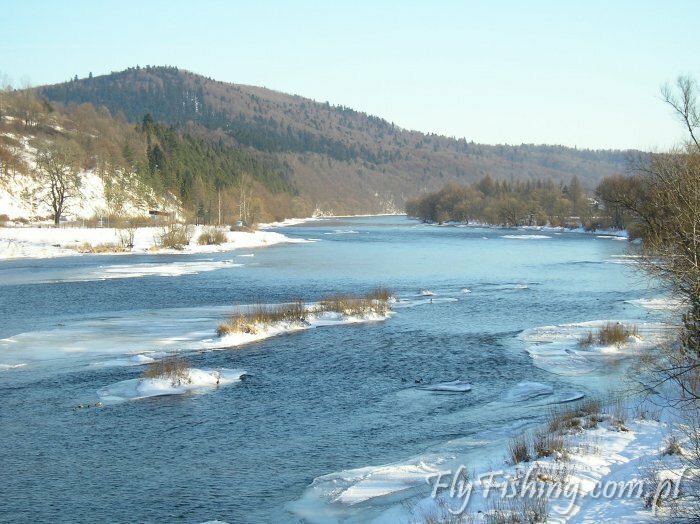 Special fishery from the power station in Zwierzyń to the Hoczewka River estuary was created in January 2004. 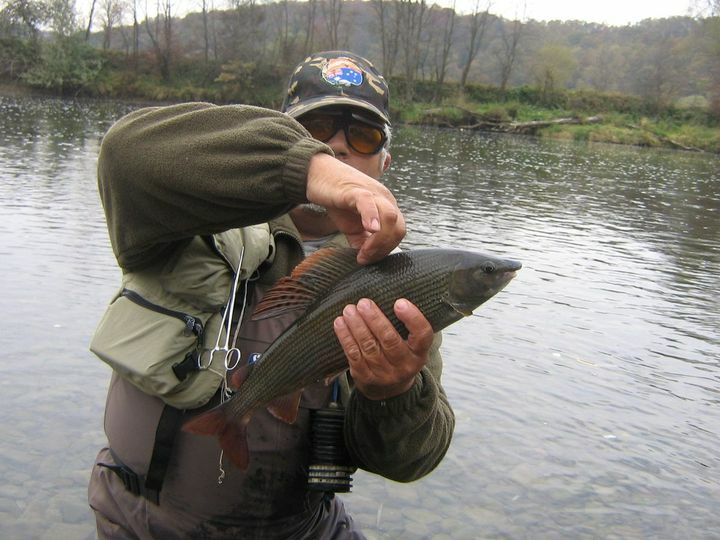 Beautiful trout, grayling and hucho hucho specimen, magnificent nature and landscapes will stay in the fishermen’s memory (those who propagate modern fishing) for years. Wyświetl większą mapę Fishing Grounds Description The asphalt road which ends near the power plant in Zwierzyń leads to the beginning of the fishing grounds. The fishing grounds start with a small glide (marked 0). 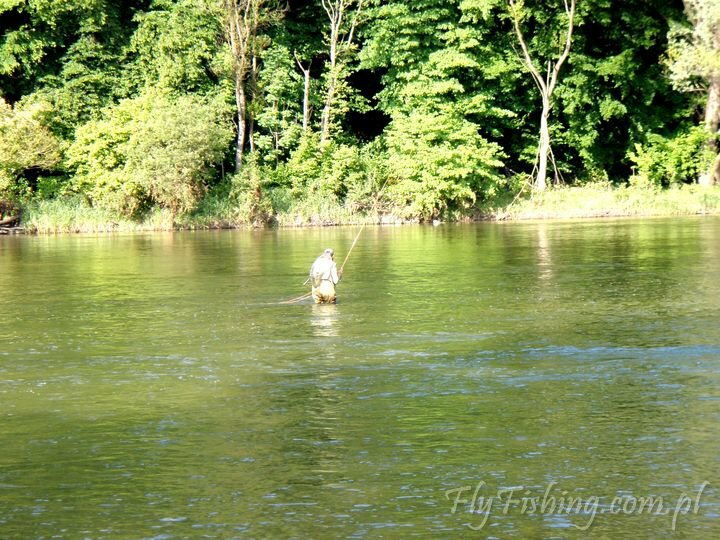 Up to the rock in Zwierzyń (marked 1) you can fish graylings and trout at low and medium water level. When it is high, it is better to leave this place. The rock in Zwierzyń (marked 1) is a good place for big fish like graylings, perch, trout, and even huchen. You can get to the spot by the dirt road, turning right before the power plant. Moving along this side of the river, you can even reach Bachlawa (marked 7) by the same road, although I would not advise doing that after the rain-puddles will prevent you from noticing bigger holes. The rock (called “bania” in Polish, i.e. pumpkin) in Zwierzyń ends in front of the first island. In the left arm of the river you can catch trout and in the right-graylings. Below the first island and before the second (marked 2) starts an excellent fishing ground for graylings and trout. Fish can be found across the whole width of the river. The fishing ground is also available at high water level. Below the second island the river is quite similar in nature, offering similar fish as between the islands. However, after a few hundreds meters the water flows a little bit faster, entering another glide (marked 4). Here, one can once again hope for thick trout and graylings. Fishing is easier in this spot when the water level is low or medium. Going down you can reach “the Huchen Hole” (marked 5). Do I not need to explain what you can catch here? However, a big grayling and a brown trout (the biggest I saw was74 cm long) can also be found here from time to time. Below “the Hole” you can catch trout and graylings even at high water level. It is however advisable to stand on the left bank of the river and move a little up the river. Access from Średnia Wieś-exit from the Lesko – Polańczyk road will lead you to the famous Eldorado (marked 6). This is just a must for an angler! 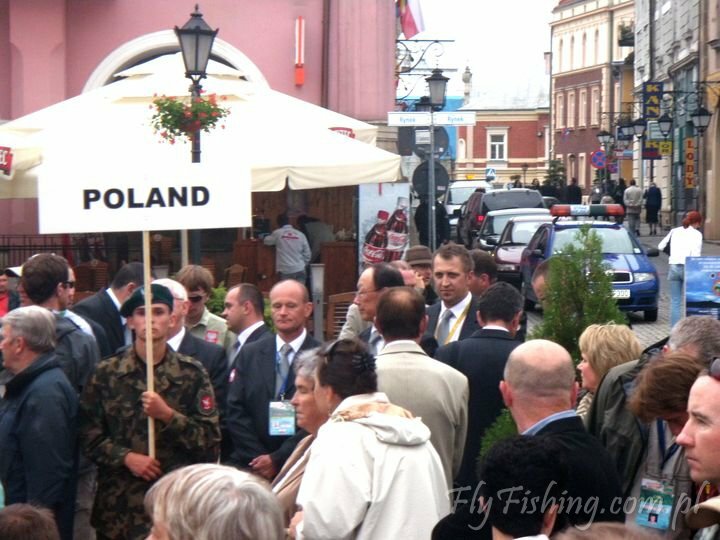 Then you pass a grayling glide and an old bridge below Średnia Wieś, reaching a ford in Bachlawa (marked 7). It is an interesting spot where a chance of catching graylings is big. Access is good, although there is not too much space for parking a car. Below the river enters a big glide called “Bachlawa” or “Pod lasem” (Near the Forest) (marked 8). Plethora of fish-various species in various size. 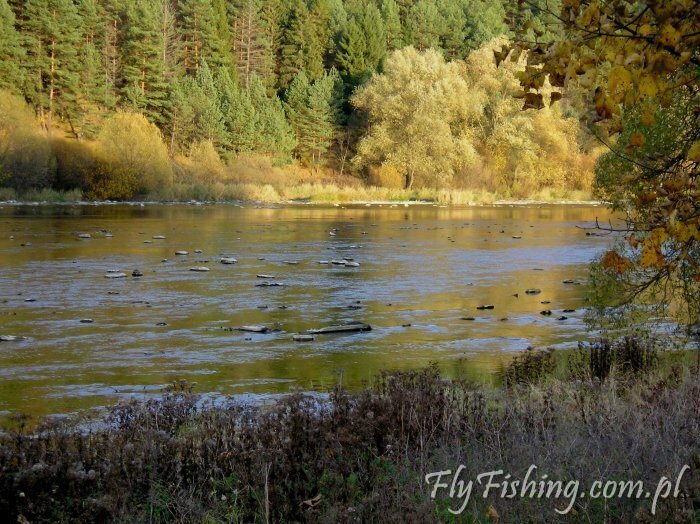 Expect to catch the biggest trout and graylings here. Access from Lesko Polańczyk road, behind the bridge on the Hoczewka River, to the left, by the dirt road. 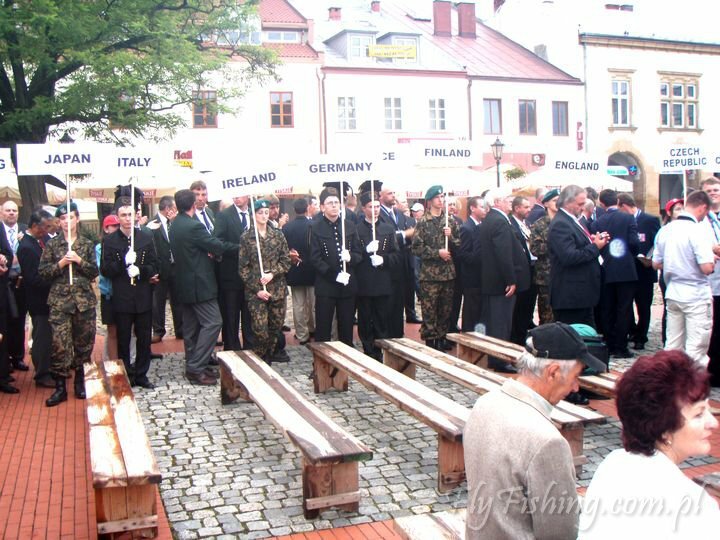 From this location there are still several hundreds meters to the mouth of the Hoczewka River (9), which is the border of the fishing grounds. Access to this place is also convenient. You can leave the car at the wood storage yard and go up the river to the fishing ground. Rules of the Fishing Grounds: Principles for fishing and fish protection. Fish may be caught only and exclusively by a fly fishing method. Fish may be caught by means of the artificial flies constructed on the single barbless hook, or hook with the removed barb. An angler must be equipped with a landing net during fishing. Taking any Salmonidae and graylings from the fishing grounds is strictly forbidden. The caught fish must be taken into the landing net and then with the utmost caution freed back to water. Between September 01 and January 31 fishing with streamers is forbidden. The number of daily licenses is limited to 15.